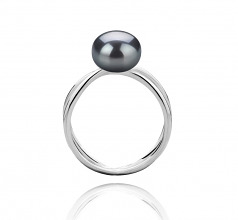 Enchant yourself or your significant other with our stunning, Esty 8-9 mm AAA Quality Freshwater Black Pearl Ring. This ring is truly mystical, adorned with a beautiful, 8-9mm Freshwater black pearl that is certain to impress and delight. 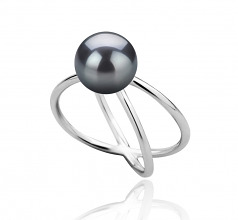 Our Esty 8-9 mm AAA Quality Freshwater Black Pearl Ring is a timeless piece, suitable for both formal and casual settings. 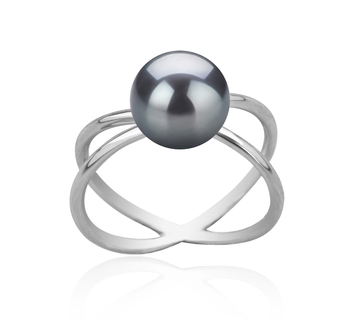 A single black pearl is placed on top of two silver intertwining bands, molded together for a seamless ring that fits comfortably on the finger. Our ring will make you feel like royalty, and pairs well with other Freshwater pearl jewelry. 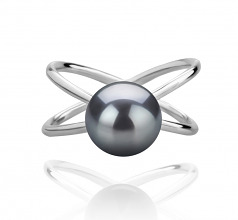 Make a statement with an uncommon ring and an even more uncommon pearl! “The ring came beautifully packaged with useful care instructions. Show only for "Esty Ring"